Read on for the best indoor destinations for imaginative play across North Texas. Kids can stretch their imaginative muscles at five different Play Street Museum locations in the Dallas area. Offering simple materials for big creativity, each Play Street Museum is set up according to its location’s theme, such as Downtown Dallas in Lake Highlands or the outdoors in Plano. Kids can roam into each section of a museum and role play using the props provided, such as pots and pans in a kitchen. Although the museums are open from 9am–5pm weekdays, there is usually a lull in the action around lunchtime if you prefer less of a crowd. Admission: $11.50 for children age 8 and younger, and children older or younger are free with a paid sibling’s admission. Hours: 9am–5pm during the week; hours on the weekend vary. Admission: $10.50 for children who are of walking age, and admission for infants still crawling is free with the purchase of a full-price admission. Sibling admission is $7.50. Hours: Monday–Friday 9am–5pm, and weekend hours vary. Welcoming kids in 2nd through 12th grade, SPARK! believes children of all ages can benefit from hands-on play. Spark’s warehouse-size space is full of places to create. With tools such as sewing machines and supplies that include recycled materials, kids can spend hours designing their own art projects or contributing to collaborative art projects that will stay at Spark. The play space also encourages creativity through movement. Kids can climb through tunnels and mazes allowing them to explore, learn, and play at every turn. Admission: $10 for kids and $5 for adults. Hours: Saturday 10am–4pm and Sunday noon–5pm. This indoor play space is all about building children’s emotional intelligence through imaginative play. Separated into three areas, the indoor safari play village is designed to make it easy for children when choosing how to focus their attention. EQ Kids Club offers a low-energy sensory area, complete with puzzles, blocks, and art supplies. Another section features a dress-up station and stores with props to spur their creative minds. Finally, the high-energy area with a slide, playhouse and trampoline is located toward the back of the play space. Children ages 1–8 can play for two hours for $12, and admission for siblings is free. Admission: $6 for children under age 1 who are unaccompanied by a sibling. Children age 5 and younger can experience museum-size learning on a much smaller scale at the Moody Family Children’s Museum at the Perot Museum of Nature and Science in Dallas. Interactive water tables teach preschoolers about what floats and what sinks. While the campfire area may feature pretend food, the spiders and snakes (safely living in aquariums) are real! Kids can sort toy fruits and vegetables in the farmer’s market, or climb around in a giant replica of the Dallas skyline. The artistic crowd can color, and budding architects can build with magnets. Kids wanting a peek outside can dig in the sand area for dinosaur bones. Admission: Entry to the Children’s Museum is included with the purchase of a general admission museum ticket—$13 for children ages 2–12 and $20 for adults. Parents must stay with their children in this special exhibit area. Hours: Monday–Saturday 9am–5pm, and Sunday 11am–5pm. Recently opened and locally owned, Little Humans, BIG Fun is a play space geared toward the 18-month to 8-year-old crowd. The inside looks like a 1980s flashback with Rubik’s Cubes hanging from the ceiling, a cassette tape-covered door, and a huge Light Bright board. There’s a play car in the shop ready for inspection, as well as a grocery store that features a conveyor belt and carts. Parents can enjoy complimentary coffee, tea and bottled water. Admission: $13 for the first child and $11 for each additional child. Kids younger than 1 or older than 11 are admitted free when accompanying someone with a paid admission. Hours: Monday–Friday 9am–5:30pm, Saturday 9–10:30am, and Sunday 9–11:30am. At Crayola Experience kids can explore all things related to Crayola—and color of course! The venue features an indoor play area, a make-your-own crayon station, and a place to create computer drawings. With plenty of places for curious minds to explore, Crayola Experience boasts 22 hands-on activities. It can literally take hours to see and do everything. Admission: $21.99 plus tax per person, but admission for children 2-years-old and younger is free. Hours: Monday–Friday 10am–6pm, Saturday and Sunday 10am–8pm. Kids can roam from playhouse to playhouse at The Playdate Co. in Richardson. With custom designed houses set side by side, this free play venue is spacious and inviting. Each playhouse has appropriately themed props, such as a student desk and globe in the school playhouse. There are four tricycles that move in a circle around the open space for children who want to ride from one location to the next. The detailed design of each playhouse will leave children feeling like they are truly in their own world. Admission: $10.50 for children age 1 and older ($8.50 for siblings). For kids under age 1, admission is free with a sibling’s paid admission or $5.50 without a sibling. Fort Worth-based Play Studio is a kid’s play space grounded in both the Reggio Emilia approach and the Montessori Method of learning. The studio, which is located in a converted 850-square-foot home, utilizes both open-ended and natural materials to engage children in play for school readiness. Out back of the studio, parents will find a dedicated room for infants, as well as multiple play areas where kids can fine-tune their motor skills and learn to problem solve in collaboration with others. In back of the studio outside, there is a playground area and a shed reserved for art and tinkering projects—which are hands-on and can get a little messy. It is recommended that parents bring a change of clothes for their children when visiting. Outside snacks and drinks are encouraged and can be kept in the studio’s kitchen until they are ready to be consumed. Admission: $12 for ages 0–7 years; $100 for a 10-Play Pass; older siblings are free when accompanied by a paid admission. Hours: Tuesday–Thursday 9am–6pm; Friday–Saturday 9am–1pm. At Small World BIG Imagination in Southlake, learning and playtime combine to help children develop important traits such as emotional intelligence and creativity. The indoor play venue, which is geared toward children age 10 and under, offers several kid-size structures to encourage pretend play. Kids can bag food at the grocery store, cast their lines off a fishing boat and inspect a car at the full-service mechanic station. Children can also use their imaginations at the puppet theater, creating arts and crafts or building with blocks or other materials. Adults can enjoy complimentary coffee and free Wi-Fi. To stay up to date with the latest events and activities, check out Small World BIG Imagination’s Facebook page or online calendar. Admission: $12 for children age 1 and up (includes snack); $112 for a punch card worth 12 visits. Hours: Monday–Friday 9am–6pm; weekend hours vary. Owned by sisters Caitlin Deville and Suzanne Fluke, The Happy Lark in Southwest Fort Worth provides 1,400 square feet of hands-on, unplugged fun for children ages newborn to 6 years. The cheerful indoor play space is equipped with a dedicated area for infants and an ever-changing selection of toys and activities, including costumes, climbing structures, building materials and books. Weekly activities, such as story time and music classes, are posted regularly to The Happy Lark’s online calendar and Facebook page. Before visiting, parents should note that The Happy Lark has a no shoes policy within its play space. Outside food and drink are allowed, but only in the designated eating area. All visitors are required to sign a waiver upon their first visit. Admission: $10 for one child, $12 for each additional child; infants under 5 months (accompanied by an adult) pay 50 percent off the regular drop-in rate; monthly membership rates are available. Hours: Monday–Friday 9am–6pm; Saturday–Sunday 12:30–3:30pm; weekend hours vary. Located inside the Fort Worth Museum of Science and History, the Fort Worth Children’s Museum is designed to encourage learning through play in children ages newborn to 8 years. The museum, which spans 9,400 square feet, consists of two main spaces—an interior gallery and an outside courtyard. Inside the gallery, pint-size visitors can enjoy practicing their shopping skills at the popular children’s grocery store or try their hands at structural engineering in the block-building area. Kids can also get an up-close look at multiple live specimens—such as reptiles and amphibians—throughout the museum. After exploring inside, little learners can head outdoors to the museum’s courtyard and experience the science of water in the water play area. Admission: $16 for adults and $4 for ages 2–18; children under age 2 and museum members are free. Hours: Tuesday–Saturday 10am–5pm; Sunday noon–5pm. There is no room for boredom at Celebration Party & Event Center in Keller, a 5,000-square-foot play venue with eight themed play areas. Children can pretend to be a grocer or doctor in the kid-size play town, or act out their favorite story in the puppet theater. They can be active in the bounce house or dress like a super hero in the costume area. Best suited for children age 12 and younger, this venue also has a toddler area, complete with a giant version of Connect Four. Shoes are allowed inside the play area, and outside food and drink are welcome. All families must sign a waiver for each child upon their first visit. Admission: $7 for age 12 months and older on Wednesday and Thursday; $10 for age 12 months and older on Friday and Saturday. Hours: Wednesday–Thursday 9:30am–1:30pm; Friday–Saturday 9:30am–2:30pm. Located next to Grapevine Mills Mall, Peek n Play is a 4,500-square-foot indoor play space that offers not one, but two levels of imaginative fun for kids to enjoy. The downstairs level features a dedicated infant area, as well as multiple play structures, including an adorable kid-size village (perfect for pretend play) and a treehouse complete with a slide and ball pit. On the second level, children can enjoy playing with an assortment of building blocks and Legos. Like other play spaces, Peek n Play enforces a no shoe policy (visitors can wear socks or go barefoot). Outside food and drink are allowed, but can only be consumed in either the party room or cafe/lounge area. All families are required to fill out a waiver before their first visit. Admission: $12 per child (limit two hours of play on Saturday and Sunday). Hours: Monday–Friday 10am–6pm; weekend hours vary. The next time you plan a trip to the Kimbell Art Museum with the family, don’t forget to drop by Studio A inside the Renzo Piano Pavilion. The cozy space, which is designed for children age 5 and younger, accommodates up to 12 children at a time and offers a variety of fun, hands-on activities to engage young minds. Inside the studio, children (along with their parents) have multiple opportunities to show off their artistic skills. One of Studio A’s most popular features is a large felt wall, which visitors can transform into a mural using abstract felt shapes. 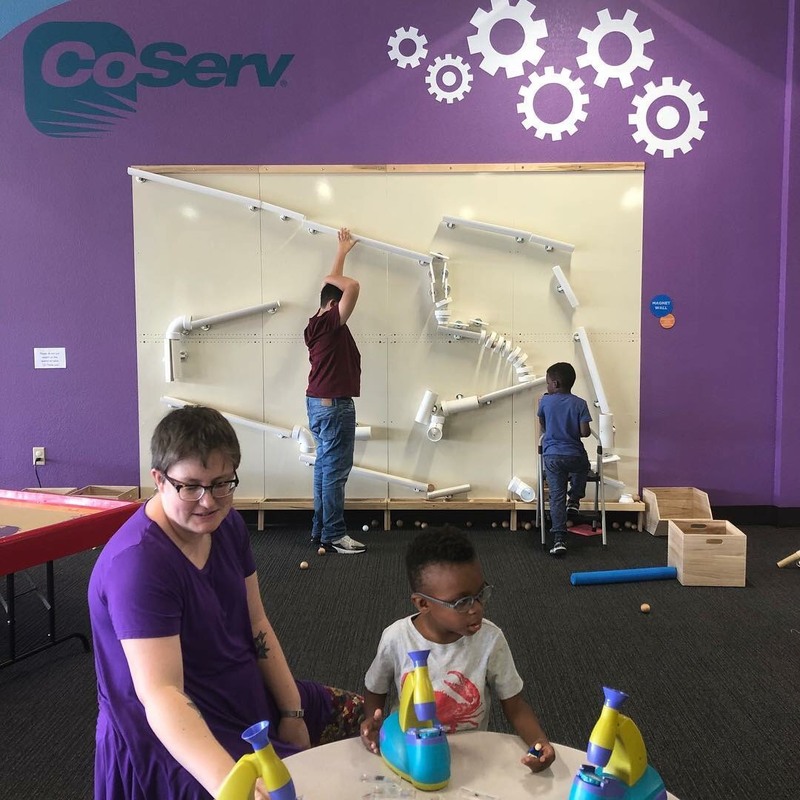 Other highlights within the space include a wide selection of building materials, a rotating library and colorful alphabet tiles that feature both braille and American Sign Language hand signs. Admission: $18 for adults, $14 for children ages 6–11, children under age 6 and museum members are admitted free. Hours: Tuesday–Thursday and Saturday 10am–5pm; Friday noon–8pm; Sunday noon–5pm. Load the kids in the car and head on down to Penny’s Playtown in Denton’s Stonehill Center. Named after owner Amy Holt’s 2 1/2-year-old Texas blue lacy pup, Penny’s offers families a clean, safe space where children can engage in pretend play. The kid-size play town features multiple play structures, including a grocery store complete with a cash register and play money, a clinic with a set of crutches to hobble around on and a café to serve up a cup of (pretend) coffee. If real food is on the menu, outside snacks and drinks are allowed but must be consumed in the designated eating area. Drop by after 3pm on weekdays for Penny’s happy hour promotion and score $6.50 admission. Hours: Monday-Thursday 9am-6pm; Friday 9am–7pm; Saturday 9am–5pm. While traditional museums prefer patrons to stand in quiet reflection and keep their hands off the exhibits, the newly opened Explorium Denton Children’s Museum encourages its tiny visitors to do the exact opposite. The 5,000-square-foot space is an interactive experience for families to learn and play together. The museum, which caters to children age 12 and younger, offers five unique areas to explore. The active body space features a giant climbing structure, and an area called “Make & Think” allows kids to create using provided materials such as 3D pens and paper. Other museum highlights include a life-size version of the classic children’s game, Operation, a fire pole and a life-size milking cow. Outside food and drink are allowed but must be consumed in the bistro area. 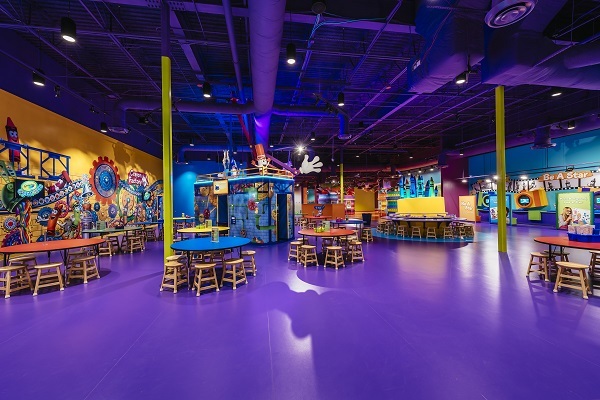 Offering multiple locations in the Dallas-Fort Worth area (including Flower Mound and Irving), Play Street Museum is an interactive play space for children age 8 and younger. Each Play Street location is set up according to a unique theme that extends throughout the design of the space. While the Irving location is themed “College” and is modeled after a university campus, the Flower Mound location looked to nature for its theme. Known as “The Park,” the nearly 3,000-square-foot space is a kid-size play town and park that includes a giant tree. Play Street Museums encourage pretend play through role playing and provide toys such as building blocks to engage the mind. Outside food and drink are permitted but must be consumed in the designated eating area. All families are required to fill out a waiver upon their first visit. Admission: $11.50 for children ages 1–8; children younger or older are free when accompanied by a paying sibling. Hours: Monday–Friday 9am–5pm; weekend hours vary. This article was first published in the November 2018 issues of CollinChild, DallasChild, FortWorthChild and NorthTexasChild. It was updated with additional reporting in January 2019.